History will be made in the Catholic Church on Thursday 10 October when a new text for the Mass which includes traditional Anglican words is officially introduced in London. The new text has been devised for use by Ordinariates throughout the English-speaking world as a way of putting into practice Pope Benedict XVI’s vision of allowing former Anglicans who wish to enter the full communion of the Catholic Church to do so whilst retaining aspects of their spiritual and liturgical traditions. Benedict XVI described these as “precious gifts” and “treasures to be shared”. The new liturgy — the work of a special commission established by Rome and now approved by the Holy See — includes material from the Anglican Book of Common Prayer (1662) as well as the Roman Rite. It will be unveiled with a Mass followed by a media launch at the Church of Our Lady of the Assumption and St Gregory, Warwick Street, Soho. 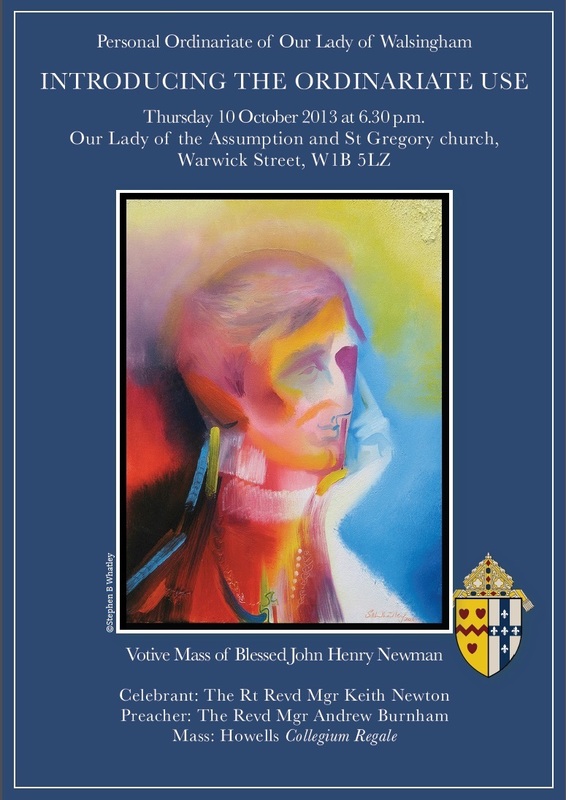 The Mass will be celebrated by the Ordinary of the Ordinariate of Our Lady of Walsingham, Monsignor Keith Newton, and the preacher will be Monsignor Andrew Burnham, Assistant to the Ordinary and a member of the commission which devised the Use. Music, drawn entirely from the English tradition, will include Howells’ Collegium Regale. The Mass will be celebrated in Our Lady of the Assumption & St Gregory’s Church at 6.30pm on Thursday 10 October. All welcome.